8%DV vitamin A, 2%DV vitamin C, 15%DV calcium, 15%DV iron. Unroll pizza dough on lightly floured surface. Pat out dough to form 18x12- inch rectangle; cut into 6 pieces. Top dough with ham to within 1/2- inch of edges, cutting ham as needed. Mix cheese and dressing; spread onto ham. Top with tomatoes. Fold each rectangle in half; seal edges with fork. Place on baking sheet sprayed with cooking spray. Bake 15 to 17 minutes or until golden brown. Save 40 calories and 4g of fat, including 1g of sat fat, per serving by preparing with KRAFT 2% Milk Shredded Colby & Monterey Jack Cheeses and KRAFT Lite Ranch Dressing. 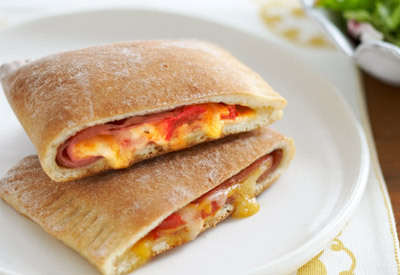 Prepare calzones as directed but do not bake. Place on baking sheet; cover with plastic wrap. Refrigerate up to 8 hours. When ready to serve, bake, uncovered, as directed. Prepare using KRAFT Shredded Colby & Monterey Jack Cheeses. Consumer and Retailer: LIMIT 1 COUPON PER PURCHASE PER PRODUCT SPECIFIED AND QUANTITY STATED. Cannot be combined with other offers. LIMIT OF TWO (2) IDENTICAL COUPONS IN SAME SHOPPING TRIP. Void if expired, altered, reproduced, copied, sold, transferred, taxed, restricted, exchanged to any person, firm, or group prior to store redemption, or prohibited by law. Any other use constitutes fraud. Good only in USA and territories. Cash value 1/100�. Consumer pays sales tax. Retailer/Clearinghouse: By submitting, you agree to Abbott�s Coupon Redemption Policy (available upon request). Abbott will reimburse you face value of coupon (or actual retail price of item if less) plus 8� handling. Send to CMS Dept 70074, ABBOTT NUTRITION, 1 Fawcett Dr., Del Rio, TX 78840. Pharmacists/Retailers: Coupon not valid for product reimbursed, in whole or part, under Medicare, Medicaid or similar federal or state government programs. All Varieties, 4 oz. pkg.